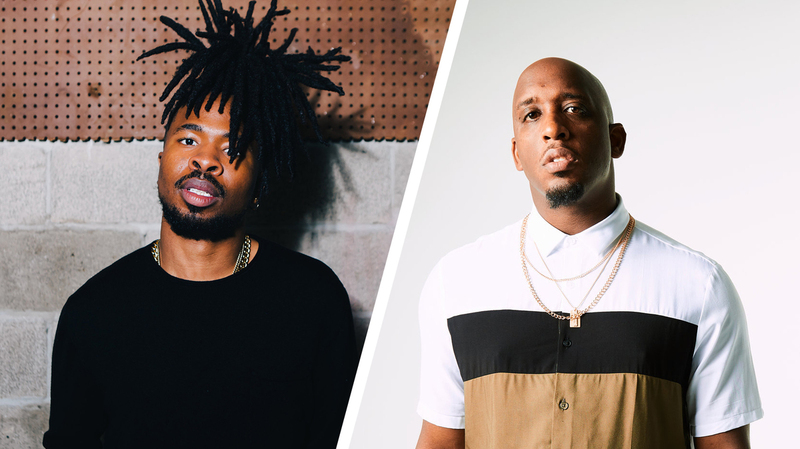 Derek Minor And nobigdyl Have Faith In Fleshing Out Their Own Compelling Visions : World Cafe As different as the two Christian rappers are artistically, they proved equally thoughtful about their aims and aspirations in conversation. Minor recalls telling him, "Go thrive, man. Go be what you wanna be." With a sly grin, Phillips offers a slight correction: "What you said was you'd never seen anybody who made it who kept a safety net." "You were still working on the song, like, still tightening up stuff," Phillips reminds Minor. "I couldn't concentrate because you were starting and stopping the beat. So I went out to your garage and wrote it, and then came in and laid it down." Minor concedes, "That's crazy, but that's the music business—nothing happens on your schedule." Phillips calls it his "intro into how stuff usually works." That sort of insight was especially valuable considering that, professionally, both artists have at least one foot planted in a highly nebulous musical world. Christian rap has often been treated as a subordinate subcategory of predominately white, pop-leaning contemporary Christian music, one that provided evangelical youth with a safer alternative to secular rap. At the same time, hip-hop has also exerted undeniable influence on black, urban gospel music, a phenomenon that's generated big crossover moments like Kirk Franklin's late '90s breakthrough, and mainstream rappers sometimes infuse their work with gospel heft. Minor and Phillips are each fleshing out their own, compelling visions for what it can look like to do culturally attuned, faith-based but not factional work in that shifting space. Phillips had released just one album and a handful of loose tracks leading up to last year's impressive major label debut, SOLAR. As a lyricist, he tends to alternate between introspection and charismatic cleverness, but even his friskiest, most lighthearted songs—"Purple Dinosaur", "enemies?" and "Shakira," for example—subtly circle around a sense of relational responsibility. His mode on much of SOLAR, though, was prickly processing, clarifying disclosure and self-examination that didn't shy away from describing descents into depression, but throughout it all, his flow retained sprightly dexterity and understated, conversational wit. Dylan Phillips: Man, I'm just a hip-hop head in general. I was the kid who had hip-hop posters all over my wall in my bedroom. I'm nerdy about it. I wasn't introduced to Christian hip-hop until I was, like, 16, and I've been rapping since I was 9. For me it's always just been about hip-hop, loving the genre, wanting to express myself. But I feel like whatever your beliefs are, whatever your life actually is, it's gonna come out in the music. ... I don't ever sit down to write a song and be like, "Alright, I'm going to preach a sermon on this," or, "I'm going to write a song about Matthew Chapter 4" or anything. I can tell that that's not where you're coming from in your songs. DP: I'm inspired by the production, and then I just start writing or freestyling until we get the song, which is how I've seen all my heroes in the genre make their songs. But my beliefs and my faith effect everything, so I do have a different approach to thinking about how to care for the listener, considering where they are, how this can help them, making sure things are packaged in a way where I'm loving God and loving them. But that's my entire life, so I just apply what I apply to my life to the music. As far as where do I see myself within CHH [Christian hip-hop], I love CHH. I love it not because it's like this exclusive group or niche. I love it because I've seen the effect, the positive effect, on so many people. So if I didn't see that, then I honestly wouldn't care about it, because it's all hip-hop to me. ...When people ask me what I do, I just say I'm a rapper. If somebody identifies me as a Christian rapper, I'd never correct them, you know what I mean? Listen to the music and whatever you call me, that's what I am. Do you think categories don't seem as relevant to you because you're coming up in a time when musical paths are less clear and rules are changing? DP: Yes. [To Derek Minor] You've taken a lot of heat, and people older than you too. I feel like y'all have taken the worst, and we don't even get some of the terrible backlash, because of some of the trailblazing. ...I saw a lot of backlash and stuff in earlier years, [fans of Christian music in general] who were expecting something different than what they got [from Minor and his contemporaries] or whatever. I don't know. What I'm saying is I can't even speak to that that much because I don't get that that much. I'm assuming it's because the people, for lack of a better term, have been run off or whatever. Derek Minor: I think people look at Christians doing art as a homogeneous group, and it's not. It's diverse. It's people that want different things from the music. They might be especially prone to think that way looking at the mostly white winners of the Gospel Music Association's Dove Awards over the years. Just in Christian music in general, you can go to most of the record labels, you can go to most of the booking agents, you won't see people of color there. Hip-hop is very diverse, but at the end of the day, it usually thrives within urban contexts. So when most people look at mainstream Christian music and they see what is celebrated, they think that that's what Christian hip-hop is. I think people look at Christians doing art as a homogeneous group, and it's not. It's diverse. I think the industry has changed a lot, probably in the last five years, because the world has changed a lot. You don't follow people on Twitter or Instagram that you don't like. After a while, if they make you mad enough, you just unfollow them. ... No one's gonna really follow you, listen to your music or any of that if they don't like what you're doing, because we all are very individualized, personalized. ... So that's a good thing, but the [other] thing we benefited from early on was a lot of people were like, "Man, I don't necessarily wanna listen to mainstream [secular] music. I'm just gonna go listen to Christian rap." And they'd just close their eyes and pick something off the shelf, because they think that that's what they should be doing. So then that's why you have such a crazy backlash when we start standing up and saying "[Socially and politically] this is what we believe." People start saying, "Wait, you were supposed to be this homogeneous thing that you think just like I think." [To Phillips] I think that that's the benefit that you guys have—that's a benefit that every artist has in today's world, I think: you can literally create your own space in your own lane. On your tour schedules, I've seen everything from clubs to contemporary Christian arena package tours. What kinds of spaces are you trying to take your music into and how do you think about audience? DM: That's an interesting question. We're kind of like the redheaded stepchild of all genres. We're the redheaded stepchild of rap, redheaded stepchild of Christian music. [chuckling] We're literally like the outcast of all genres. I think what has to happen in order for Christian rap to survive is that it has to create its own space. If you wanna know what my 10 year goal is, it's to create infrastructure and its own space and niche to where it doesn't have to be the redheaded stepchild of any space; it's its own space, but still connects in those other spaces where it makes sense. Because I think that's what hip-hop did early on. No one would sign hip-hop artists—that's why Def Jam was created, because no one would sign Rev Run. They created their own space and then once its validity was proven, it was ingested into the mainstream. And I think it's the same thing for us. DP: For me, the touring piece is kinda just now taking off. Like 2015, it was just literally whoever would listen — open mics, it didn't matter. Now that we have a platform where we can kinda choose where we want to press into, whether we want to press more into the church market or the neutral venues. That's an interesting way to put it—the church market versus neutral venues. Do you mean clubs? DP: Yeah, clubs. That's what the booking agent asked me: "Do you wanna do churches or do you wanna do neutral venues?" I was like, "Oh, I didn't know it was a decision. I thought it was just whoever." We're pushing towards the clubs and stuff. Going off of what [Minor] said, we're trying to build an audience that isn't there just because it's an event that they would be there [for] anyway. They're coming to hear your music—they're not coming because it's this church's blowout and "Whoever's there [performing], we're gonna be there [regardless]." ...I feel like it is the way forward, like Derek was saying, building your own audience and not relying on soft ticket events and stuff. ...But I wouldn't turn down a Christian festival or anything. Those are still my people. I don't see any division. Listening to the albums you each put out in 2018 and how you talked about them, I could tell that you were both pushing beyond the parameters placed on CCM's tones and themes in the past. But that took very different forms for each of you. Where were your heads at? DM: ...When Mike Brown was killed in St Louis, I remember being like, "Yo, this is messed up." All of the sudden, I started getting people saying, "I'm never gonna listen to your music again." ...That was kind of a shocker, because I never thought that Christian people... Regardless of what you feel one side or another [politically], there's still a way that you talk to people and treat people and sympathize and empathize with people. It's crazy when you think about how Christianity has almost married itself to politics and power. When you look at it, it's almost like, "We'll find any way of making more money and having more power, or keeping money and keeping power—we'll find any way to make that godly." So I've been on this journey just kind of trying to figure out where do I live within that? On one end I am a Christian. I love God. On the other end, the things that's evangelicals, specifically white evangelicals, have said about African-Americans, I don't reflect those things, and most of the people I'm around don't reflect those things. Just hearing how people will talk, I'm like, "You're a Christian! I performed at your church! I know your family! How could you say that about people that look like me?" So The Trap was kinda like all of my thoughts about the last four or five years, all of the things I've learned and grown from. I've had to create an apologetics to why black people are valuable, which is very sad. ....It was one of those things where I was like, "[I'm] either gonna talk about what's on my heart or I'm just gonna pretend and go along." But if I can't be fully who I am and I feel like I have some sort of invisible box I have to sit in, then I'm actually a slave and I'm no better off. So I was like, "I'm not gonna be a slave. I'm just gonna be honest and be who I am and let that music live." It was all from the heart. I was making music and that was just what was coming out. I didn't have a playbook. When you released the video for "It Is What It Is", it struck me that you were calling out the systemic social and political causes of economic and spiritual suffering. That seemed really significant. DM: Well I'm from that [reality], so it was personal. ...I'll never forget this: When I was recording Minorville, I'm in my studio, and it was in a storage unit. ...Usually 11 o'clock was the cutoff period, and I was about 10:45, maybe 11:15, a little late. But the lady [managing the office] comes down and she's like, "Cut it off! You're done!" ...She's yelling at the top of her lungs. And then she says, "And I have a gun and if you want to come back and retaliate, we can handle this. I don't deal with thugs." And I'm like, "I am a Christian rapper!" ...When I would hear those things, I'm like, "Wow, my skin makes me a thug for a lot of people." ...All they have is what they hear from politicians—the dog whistles they hear from politicians—or what they hear on the news or whatever. It was like, "Nah I'm gonna tell the whole truth, nothing but the truth, so help me God, with conviction." DP: The music that has always affected me the most has been the introspective artist who doesn't necessarily present the problem and tell you how to make it better, but gives you an autobiography. ...My goal with SOLAR was, "Here's all my scars, so you don't have to have them." Like you were saying, it felt like it's a taboo in this space. You're right, it's not a taboo in the mainstream, but I still don't think they give an accurate picture of the nuance in romantic relationships, or even interpersonal relationships. DP: Right. That's why I became a fan of him, was because of that introspection. But he would like get there, and then it would turn left to some wild devaluing of the woman. Specifically I was like, "I wanna do this without devaluing women, or devaluing other guys." It's a thing of status if I'm sleeping with your girl. ... Over on the Christian side, I feel like it's like, "We just don't talk about relationships, especially not the ups and downs. And if we do, we make one platitude-filled, base-level, almost obligatory song about marriage." DM: I think it's trailblazing for [Phillips] to talk about depression in the way he's talking about it, reconciliation in the way he's talking about it. The thing is, there are people in this world that love God and they're depressed, and they don't know what to do about it, because they listen to any Christian music and Christian author, and [get the message], "Pick yourself up out of depression." ...What if I have something chemically that I have to deal with? No one talks about that. They just gloss over it, because we haven't thought about complex issues on a deep level, a lot of people haven't. DP: ...I'm not tying up every song in a bow. [The song] "block me back" doesn't resolve in a way that feels comfortable; it's abrasive. "pressure" , that's the one about depression and anxiety, and I honestly wrote that for artists. ...There's no happy ending at the end. ...It was the same heart that did The Trap and SOLAR—like, "Yeah, it's these taboo subjects, but there are people we know that are important in our lives that we feel like can heal from these stories, but people have told us not to tell these stories." Like [Minor] said, he didn't have the whole thing planned out, but his father, stepdad, his grandmother deal with drug addiction, and he's seen that systemic oppression firsthand. So all he does is put his heart on the song and The Trap comes out. I've gone through the pain of confession and reconciliation and depression and anxiety and having those pressures on me, so that's what comes out. I knew there weren't any slam-dunk super playlist-able songs on the album. I knew that, but I was like, "This has to come out." Derek, since you've been heading down this path for a while, have you seen the response to the truth-telling in your music evolve? DM: ...Well, I have seen things change some. I remember I put this song out called "Free". That was like the final straw for some of the people that were holding on by a thread in certain groups. But I remember I was on an arena tour, this lady just walks up to me and gives me the biggest hug. Then she puts this note in my hand. ... She said, "I remember thinking that black people were just whining. I never considered myself racist, but just listening to your music made me think I have some work to do on myself. I remember watching your video weeping. Thank you for making this music and being gracious in how you made it." I thought to myself, "Wow, people are actually being impacted by that in a great way." This issue doesn't go away. Black people have always known about police brutality and things in our community. It's just now everyone is getting a glimpse at how frequently those things happen. You see it, so you can't run away from it. Now everyone's asking, "Okay. then what's the issue and how do we fix it?" Everyone has different ideas and opinions. So I have seen light in that sense. But I think, for me, I've seen light in myself. Going down this path has affirmed my faith more than it has made me lose faith, regardless of people, how they feel about me. I know who I am, and I think that is what I've benefited the most from in this season, and I've been able to take people along on that journey with me. I've noticed that music critics who don't tend to pay attention to Christian music take what you're doing seriously. DM: There's a lot of Christian artists in general that say there's hostility towards their music because it's Christian. I don't think that's always the case. ...The issue for a lot of people's music is not that it's Christian—it's that it's arrogant or one-dimensional or a carbon copy of someone else. ...Oftentimes they wanna follow the typical Christian tropes that'll get them Christian bookings, and they get frustrated that that doesn't work outside of that bubble. ... So if I say, "You dumb drug dealers, get your life together!" If a drug dealer hears that, how does that impact them? So then why do I get frustrated if drug dealers are like, "I'll never listen to Christian music?" Of course not, because you just trashed them! I think people have listened to [my] music, and they're like, "This is Christian rap?" And it's just because I'm being honest and also gracious and also trying to be myself. I'm not trying to be like, "What's the hottest record out there? Let me make the safe version of that." I'm making my own way, and I think people respect that, even if they don't even respect your religion.